Kind of got around to writing about this recording because I'm returning this favor to a certain friend, who I just found out actually reads my blog... I found out that she used to play the French horn, so I can only do justice if I review music that includes the horn. 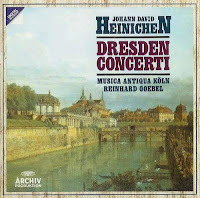 To my knowledge, I cannot think of another early music recording of mine that feature the horns as prominently as this MAK Heinichen Dresden Concerti album. The CPO recording of Zelenka's orchestral works was a close second. MAK made this recording in 1993, a few years after they recorded their award-winning Telemann's Tafelmusik. This time, they managed to top that by winning five prizes, including the Jahrespreis der Deutschen Schallplattenkritik and the Gramophone Award. More importantly, their decision to record a virtually forgotten composer probably brought awareness among other period musicians but ultimately gave the public an opportunity to know him and hear his music for the first time in centuries. So what do know today about this Heinichen, whose name most resembles a certain name brand beer? Heinichen was born in 1683 in the small town of Crössuln, next to Weissenfels, which is close to Leipzig. Like his father, he entered Leipzig's Thomasschule at thirteen. Because of the school's connections with the Thomaskirche, the students were sure to receive solid musical training. In addition to the instruction of the then-cantor Johann Schelle, he took keyboard lessons with Kuhnau, who would become the next cantor (and the predecessor of J.S. Bach). Like his mentor Kuhnau and Telemann, Heinichen went to the University of Leipzig and studied law, which apparently was a common route for many musicians. The newly-built Leipzig opera house would attract many of the university students (Heinichen included) to participate in the opera productions. It was at this time that Heinichen was introduced to this theatrical music style. Upon graduation, Heinichen moved to Weissenfels to practice law. However, that did not last for very long. The Weissenfels court was musically cultured, as the Kapellmeister Johann Philip Krieger was highly revered, having studied in Italy. Krieger apparently was fond of Heinichen's compositions enough that he gave a performance of one of young Heinichen's cantatas. A few years later, he was asked to compose music for the Leipzig opera season. He never looked back at a possible career as a lawyer. Before his position at the Dresden court, Heinichen found employment at various German courts. However, the most profound influence on him was the seven years he spent in Venice. There, by meeting Gasparini and Lotti, and most likely Vivaldi, he learned the latest musical styles, the more dramatic Italian style. When the crown prince Augustus of Saxony stopped by Venice in 1716 during his Grand Tour, Heinichen was given the opportunity to compose a cantata for Augustus's birthday. The crown prince was very impressed and immediately tried to appoint Heinichen as the Kapellmeister to the court of Dresden. Heinichen would wait for another year to come aboard. When he did, he remained there until his death in 1729. In the late 17th century and early 18th century, the Dresden court had arguably the most talented and virtuosic group of musicians. Each musician was one of the best, if not the best, on his own instrument. These include Pisendel and Veracini on the violin, Buffardin and Quantz on the flute, Zelenka on the violone, Weiss on the lute, just to name a few. The luxury of having such a gathering of musical talent meant that the composers did not need to hold back when writing their music. Instead, they could allow their imaginations run wild, knowing their peers were more than capable of playing the part. The other interesting phenomenon that arose out of this talented crowd was that the Italian concerto took on a new distinct flavor when assimilated into the Dresden court. 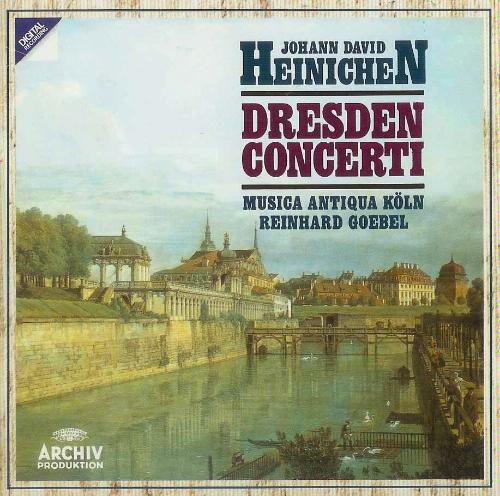 Instead of featuring just one soloist, the Dresden concertos featured multiple soloists (per molti strumenti). I reviewed a CD of Vivaldi's concerto for multiple instruments a while back, and I commented that concertos of these kinds were rarities in Italy. Here in Dresden though, that was considered the norm. There is no fixed group of soloists for the concertos, but you expect to hear combinations of flutes, recorders, violins, oboes, horns, bassoons, cellos, and even one with theorbo. As I commented, this recording features the natural horns a lot. It is suggested that many of these concerts probably took place at Augustus's hunting lodge, where the horn rightfully evokes themes of hunting. It was also not uncommon for the musicians to travel with their royal employers on their various trips. Yeah, why not bring the whole orchestra to your hunting trip? This is before the age of walkmans and iPods. While the majority of the concertos are in three movements, you can find ones with 4, 5, or even 6. The concertos recorded here are all very uplifting. All of them are written in the major key, and the music is highly extrovert and outgoing in nature. Heinichen was known to regard his music as highly fashionable among the other more out-dated Germans. He found that German music which stressed the importance of counterpoint was old-fashioned in that it was good "eye-music" that looked great on the score. However, he felt that music of "good taste" should be good "ear-music" that caught and pleased the ear upon first listening. Heinichen said he was speaking from experience, since he used to advocate and defend the highly contrapuntal style. Therefore, you won't find, as my friend biberfan puts it, the "gravitas or profundity of Bach". As a great theorist Heinichen was known to be, it is safe to say that this was a highly conscientious choice of Heinichen. There's not much more that needs to be said about MAK. Besides introducing Heinichen's to the world, something invaluable itself, MAK puts the icing on the cake by bringing their trademark playing style: brisk, powerful, yet amazingly precise. While this is expected of their string players, the wind players manage to hold their own in this highly-charged playing, especially the horn players, who are dealing with a totally different beast. With the interesting choice of instrumentation, this is also one of the largest MAK casts you will see, and one of the greatest early music talent assembled on record. Made nearly 20 years ago, this recording has aged extremely, and I do mean extremely, well. While occasionally there's a feeling of a thin background sound, most likely to recording engineering choice, otherwise this could easily have been passed off as a recent recording by today's early music standards. This set has been re-released in 2007, which is a testament to how monumental this recording was. More than 2 hours of sheer excitement and joy, and no hesitation in recommending this one!